Hey guys, it’s Kristen again, back with part two of my beautystoredepot top 10 products I’d like to recommend to y’all today! I hope you all had a chance to read part one of my top 10 beautystoredepot products, if not be sure and check it out! Here are my remaining five favorite products. 6) Enjoy Luxury Shampoo & Conditioner: Obsessed! Not only is the shampoo sulfate-free and color safe, but these products combined truly leave my hair feeling luxurious. The shampoo has a pH level of 5.0-6.0 and can be used in addition to shampoo, as a skin wash. The conditioner's pH level is 4.5-5.5 and can also be used as a shave cream or moisturizer. Finish your clean hair off with the ENJOY Conditioning Spray or ENJOY Leave in Conditioner while still damp, and your hair will thank you in return with gorgeous, healthy, and luxurious locks. 7) EltaMD UV Daily Broad-Spectrum SPF 40 - Tinted: Considering I am a fair-skinned, natural red head, you'd think I would have been the type to already have been using a sunscreen on a regular basis. However, it wasn't until I started working here that I realized how crucial it really is to be wearing a sunscreen at the very least on your face, EVERY day. In fact, I feel guilty on the days I forget to apply it on myself or my son now. This sunscreen protects from both UVA & UVB (hence broad-spectrum) sun rays and is very lightweight. I use it every morning after washing my face and still apply my makeup over it with no issues. The tint is subtle and evens out your skin tone while bringing out your natural color. As with most Elta products, this sunscreen is fragrance-free, paraben-free, sensitivity-free and noncomedogenic. If you aren't interested in the tinted version, there are non-tinted versions as well! You can view all of our Elta products to find the best fit for you. 8) Jan Marini Eyelash Conditioner: I have been using this product every night for about a month now. I was initially skeptical considering I've tried similar products in the past without any real results. However I am now a true believer! My lashes have definitely grown and not only has it added length to them, but I see that there is new growth as well. I had a lash curling incident several years ago that pulled out a patch of lashes that never fully returned. Now I see the space that was there filling in and my little bald spot is now covered with new lashes! When all of my eye makeup is off and prior to curling, is when I can really see the results best as my bare lashes now reach almost up to my brow bone. Worth the splurge! I actually used this product to successfully cure an injury on my cat's tail in the past. My cat came home one day with a large open wound on his tail that he would not leave alone. He was over grooming it which in return was making it harder for the injury to heal. I started spraying the Thermal Water directly on the wound and within about a week the injury was nearly entirely healed. The product is straight water so there was no irritation, burning or side effects of using it on him (or anyone). I carry the small version of this in my car for on the go and find myself using it far more often than I would have imagined. 10) TheraPearl Pals: Featuring Ribbit The Frog, Ping The Panda, Buddy The Puppy, and Pearl The Pig, this is a must-have for all parents/grandparents/nannies or caretakers! It is the ultimate drug-free and fast solution to your children's booboo's, cuts/scrapes, bug bites, fever, or tummy aches! They can be used frozen, or heat it in a microwave to be used warm for up to 20 minutes. TheraPearl Pals won a Parent Tested-Parent Approved Award for quality and appeal for these products. There are no heavy metals, VOCs or BPAs. They're safe, hypoallergenic, reusable, and wont drip or leak. 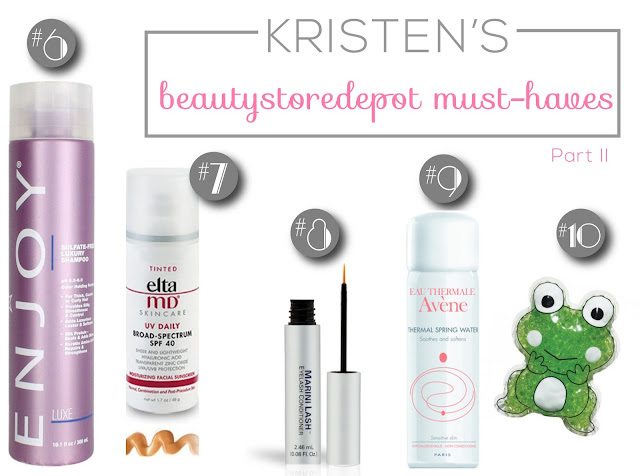 There you have it, my top ten beautystoredepot products! Working at beautystoredepot, we frequently get to try new products and I still have several I’d like to recommend. So if any of you ever have any questions regarding the products mentioned, or if you are in need of any suggestions in general I am more than happy to help! Hope y'all have a beautiful day!